Are you getting ready for the 18th annual Grove Park National Gingerbread House Competition! The competition date is November 15, 2010 and the sweet sugar and spice masterpieces will be on display November 17, 2010 – January 2, 2011 in ASHEVILLE, NORTH CAROLINA. I can’t wait to see the incredible creations for 2010!! DETAILS HERE. 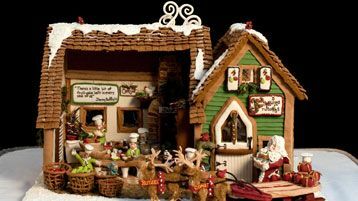 Gerry Hempel-Davis, A judge at every National Gingerbread House Competition since its inception. She was a lifestyle contributor for several years on NBC’s Today Show and part of the production team at CBS for the Ed Sullivan Show. Nicholas Lodge, Chef Lodge is recognized worldwide as a top instructor in the sugar craft arts and the author of numerous books. He has been a judge of the National Gingerbread House Competition since 2004. Nadine Orenstein, Curator of the Department of Drawings and Prints of The Metropolitan Museum of Art specializing in Dutch, Flemish and German art. She brings her artistic eye and historical knowledge to the appreciation of gingerbread houses. Mark Seaman, Founder of Marked for Dessert, a boutique cake shop in Chicago. He teaches the art of gum paste flowers at the Wilton School of Cake Decorating and the French Pastry School’s L’Art du Gateau Professional Cake Decorating and Baking Program. Carol Gable, has been a producer the last 15 years for the newsmagazine, “Dateline NBC”. Michelle Pulliam, Food and Leisure Coordinator for Southern Hospitality Magazine—Traveler. Jane Robelot, is a nationally acclaimed television news anchor and correspondent and the recent recipient of a Peabody award. Jane interviewed such newsmakers as President Bill Clinton, First Lady Hillary Rodman Clinton, Evangelist Billy Graham as well as many actors and authors. Denny Trantham, is the Executive Chef for The Grove Park Inn Resort & Spa. His southern Appalachian culinary skills are reflected today in his innovative and diverse Southern elegance cuisine that is offered throughout the resort. He also works closely with the local famers in order to provide the freshest ingredients, while also supporting the local economy.